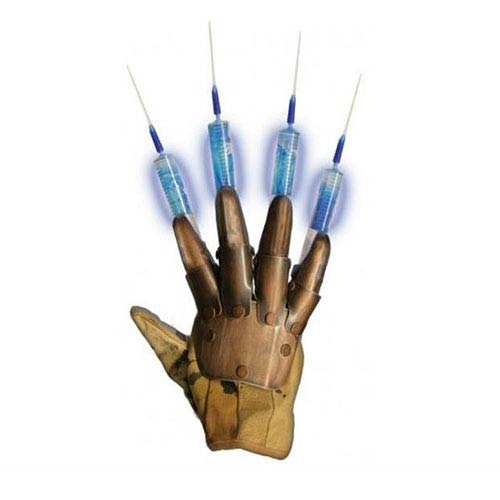 Wear the syringe glove from A Nightmare on Elm Street 3: Dream Warriors! Features articulated fingers and syringes that light-up in blue. Makes for a great addition to your Freddy Halloween costume! From A Nightmare on Elm Street 3: Dream Warriors, it's the Nightmare on Elm Street Freddy Krueger Syringe Glove! This glove inspired by the horror movie features copper metallic articulated fingers and plastic syringes that light up in blue. The plastic glove features a copper metallic paint deco. Whether you want to use these as part of a Halloween costume or as display at home, you'll love the realistic replication of the Nightmare on Elm Street Freddy Krueger Syringe Glove! Requires 3x "AG13/LR44" batteries (included). Ages 17 and up.